Below is a video on how to clean your barbecue grill and grill grates, so you can have a good barbecue. The video suggests some maintenance and cleaning after every use of the grill, and then also some annual (or semiannual) more intensive cleaning. The regular cleaning includes scraping off the food residue from the grill grates with a wire brush, after every use. In addition, you should clean the outside of the grill of food splatters before they get sticky and hard. The video also suggests the good idea of having a mat where you stand next to the grill to help protect your deck or concrete from the grease splatters that occur while you are cooking. That will definitely save you some headaches when trying to clean your deck or concrete, and is quite simple and easy. Love it! Finally, the video discusses the more involved cleaning, and is quite thorough in its directions. They are a bit complicated, so watch the video for complete details. 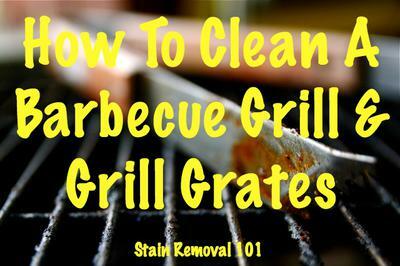 Hope these tips help you have a good barbecue, and avoid some common barbecue stains! You can share your own barbecue grill cleaning tips here, or read others already submitted. Join in and write your own page! It's easy to do. How? Simply click here to return to grill cleaning.